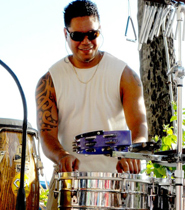 Born to the “Sophisticated Savage”, Augie Colón Sr. (original member of the Exotic sounds of Martin Denny), Augie Borero “Lopaka” Colón Jr. has followed in his fathers’ footsteps and is taking those steps forward to the next generation. 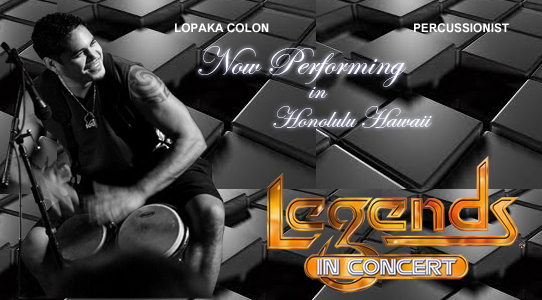 Lopaka Colón graduated from Moloka’i High School in 1992 with a scholarship to attend the University of Hawaii (U.H.) @ Manoa. He attended U.H. for 6 years majoring in Ethnomusicology with a minor in Spanish language. While in the U.H. Music program, Lopaka performed with the U.H. marching band, Symphonic and Jazz ensembles. 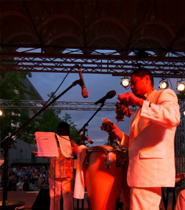 He also played Afro-Cuban rhythms off and on campus in a Percussion group named “Campus Drummers” headed by Russell Robertson “SANGO”. 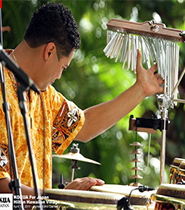 As a student, Lopaka intergrated the teachings of his father, private Afro-cuban/Classical percussion lessons, and U.H. schooling into his own unique style. 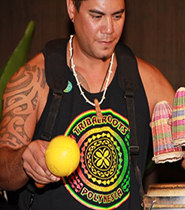 Lopaka Colón is an established percussionist and multi “Na Hoku Hanohano” award winner (Hawaii’s version of the Grammy’s). 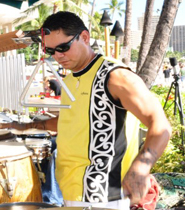 In the late 90’s, Lopaka found musical success in a band named “Pure Heart”, rated in the top 50 musical groups of all time of Hawaii and also one of Hawaii’s youngest musical groups ever to take the local music scene by storm in such a short period. The group later evolved into Colón (in honor of Lopakaʻs father-Augie Colón). 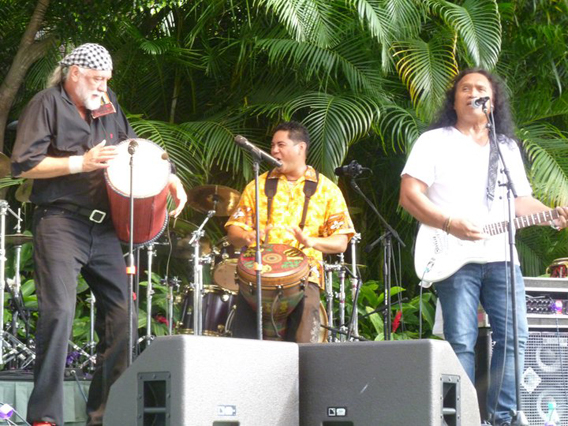 Both bands won the “Peoples Choice” award at the Hokuʻs as favorite Entertainers of the year for 2 years in a row. 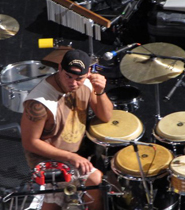 He has collaborated with majority of Hawaii’s top-notch musicians either doing studio work, live performances, or just having fun “Kanikapila”(musical jam). 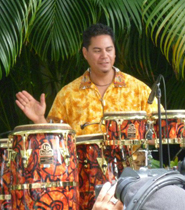 Currently he is a key component in the success of several local bands like the Grammy-nominated “Wild Hawaiian” project with the Henry Kapono band, the Barefoot Natives (uncle Willie K. & Eric Gilliom), living legends-C&K, the Makana trio (slack-key/world-fusion), the Waitiki 7 (Classic Exotica for modern listeners), and Don Tiki (Las Vegas type of an Exotica show band) to name a few. 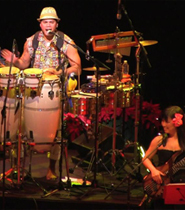 Lopaka has also collaborated with Michael McDonald and Rock-n-Roll hall of fame drummer-Mick Fleetwood and his “Island Rumours” Band performing for corporate clients. 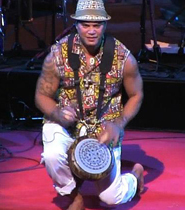 Most recently, Lopaka has played a key role in a non-profit group, The Mana Maoli Collective. This collective group supports the education of native Hawaiian children in Hawaiian charter schools via benefit concerts, CD sales, cultural events and workshops. This group also represents Hawaii in the largest Polynesian festival focused on the cultural art forms of Polynesia in New Zealand called The Pasifika. Lopaka currently performs 6 nights a week as part of a house band in the world renowned show “Legends in Concert” at the Royal Hawaiian Theater in the heart of Waikiki. The show features impersonators such as Elvis, Madonna, Lady Gaga, Michael Jackson, Little Richard, Steven Tyler, and Elton John to name a few. 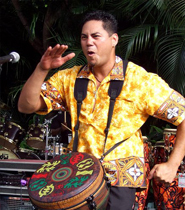 In his spare time, Lopaka also drums for Tunui Tully and the Royal Polynesians, a family Tahitian/Hula Halau that features Story-telling, Dance, and Music of Tahiti and Hawaii. 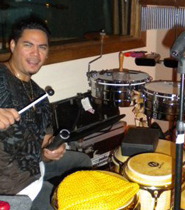 For the first time in his musical career, Lopaka is spearheading his own group/band/project called “IntoxiKa”. 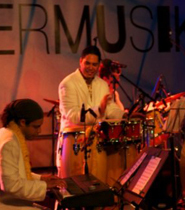 It is a blend of esoteric and conscious themes with vintage interpretations of Exotica, fused with Funk, Rock, Dub(step), Latin jazz and Hip-hop grooves while honoring the forefathers of Exotica and getting the next generations’ “groove on”.